There's nothing between Lewis Hamilton and Nico Rosberg in this picture, and there was nothing between them on the circuit today. Rosberg got the edge by grabbing pole, but Hamilton is sure to try and bite back tomorrow. We'll be back at the delightful hour of 05:00 BST for build up to the race, but I'll leave you in the capable hands of Murray Walker, as he looks back on some classic rivalries on BBC Two and online. Watch it here now. We are just about finished up here. In case you were not up for qualifying, it be will be replayed on BBC One at 13:00 BST. A clip of Daniil Kvyat's crash is available now and you can watch it here. A win for Sebastian Vettel would mark a first for the Ferrari man. He will line up fourth on the grid tomorrow and has never won a grand prix from outside the top three. I am disappointed in myself. I had the rear wheel on the grass and lost the rear of the car and went into the barrier. Daniel Ricciardo has just passed Daniil Kvyat in the paddock. A thumbs up from Kvyat seemingly to indicate he is OK.
With normal service resuming, Mercedes have secured their 10th front-row lockout of the season. If you are still in the mood for a bit of Formula 1 action then hit refresh on this page now to watch some old school racing on F1 Rewind. Quote Message: I expect the two Mercedes cars to run away with it at the front tomorrow. Lewis will want to get his own back. I expect the two Mercedes cars to run away with it at the front tomorrow. Lewis will want to get his own back. Pole for Nico Rosberg is his first since the Spanish Grand Prix in May. He went on to win that race, and followed that up with wins in two of his next three races. A repeat of that run of form would be a massive boost to his title hopes. Quote Message: Amazingly Hamilton has not had pole here. He will remember last year. He was not on pole but he was able to keep up the pressure on Rosberg, pass him and take victory. Amazingly Hamilton has not had pole here. He will remember last year. He was not on pole but he was able to keep up the pressure on Rosberg, pass him and take victory. Can Lewis repeat his success here last year with a win tomorrow?Image caption: Can Lewis repeat his success here last year with a win tomorrow? Lewis Hamilton looked pretty relaxed about his qualifying result in the news conference just now. He started from second at last year's Japanese Grand Prix, behind Nico Rosberg, but went on to secure victory. Will he do the same tomorrow? I am confident that the car will be good on Sunday. Like everybody else we did not have the perfect preparation so there could be a few surprises tomorrow. Third is very good for us. We knew this track would be better for our car. Today was a difficult qualifying because of the rain on Friday, so a good surprise. The first lap I lost a bit of time in Turn 11 and in the last corner. Nico is driving well this weekend. I felt pretty well on that last lap but the main thing is that Kvyat is OK.
A great day today. A good comeback for the team after such a difficult weekend in Singapore. We really turned things around and I pretty much nailed my laps today. Great position for tomorrow. Could Lewis Hamilton have nicked pole position if the red flag was not waved? We'll never know, but regardless it should be a good fight tomorrow. There's been little between Hamilton and Nico Rosberg so far this weekend. It was a big impact, but the main thing is he is fine. A little bit winded. I think he was trying to optimise all the track he could to get as much speed out of it he could. A dramatic end to qualifying, but the main thing was that Daniil Kvyat was fine. No damage done, except to his pride possibly. It was a big crash as he struck the barrier and the car then rolled, before coming to a stop. Quote Message: All credit to Rosberg, he went out there and put that lap in nice and early. He has delivered. All credit to Rosberg, he went out there and put that lap in nice and early. He has delivered. Nico Rosberg secures pole position for the Japanese Grand Prix. Massive impact as Daniil Kvyat crashes into the barrier, wrecking the Red Bull. He is quick to say he is OK over team radio. Red flag with 30 seconds or so left on the clock. Ok then, here we go. One last roll of the dice in the battle for pole. A good lap from Valtteri Bottas as he goes third fastest. Williams are looking good at Suzuka. Sebastian Vettel, meanwhile, is sixth tenths of a second slower than Nico Rosberg in fourth. Third on the grid the best he can hope for? Advantage Nico Rosberg in the first stage of the final part of qualifying. He puts in a 1:32.584 and Lewis Hamilton (pictured) is oh so close with his effort, 0.076s, but he needs to find more if he is going to get pole. The top 10 shootout is under way. 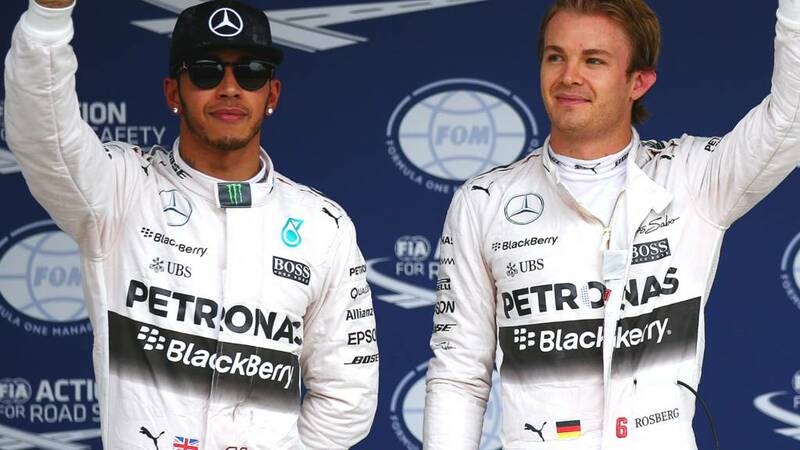 It is looking like it will be a Mercedes on pole, but will it be Lewis Hamilton or Nico Rosberg? They didn't tell me what setting to be in at the start of the lap. In the last half of the lap I didn't have any deployment. We can't make mistakes like this. I suffered a loss of power. It was very frustrating. It is the fifth time in qualifying I have had those problems. Nico Rosberg finishes fastest in the second part of qualifying for the Japanese Grand Prix. Fernando Alonso isn't going to make it, his only timed lap is only good enough for 11th. Those below him on laps now and with the chance of pushing the Spaniard further down the grid. Into the final two minutes and the drivers in danger at the moment are Sergio Perez, Romain Grosjean and Pastor Maldonado. No time from Fernando Alonso, but he is out on the circuit now. Kimi Raikkonen is third fastest after a 1:33.361 but Sebastian Vettel's hopes of challenging for a second successive win tomorrow is looking unlikely. He is a good five tenths down on Raikkonen in sixth. Romain Grosjean is in the dropzone at moment, as his Lotus team-mate Pastor Maldonado. Felipe Massa is third fastest but his best effort is seventh tenths of a second slower than Nico Rosberg. Nico Rosberg gets things going with a 1:32.632, Lewis Hamilton then goes 0.1s slower. Mercedes are very much looking like they are back on point. The track is open once again and 15 minutes of the second part of qualifying is under way. Nico Rosberg is straight back out on to the track. Lewis Hamilton finishes fastest in the first part of qualifying for the Japanese Grand Prix. That's a blow to anyone hoping to improve their times as the chequered flag comes out. Who misses out? Yellow flag as Max Verstappen's Toro Rosso has come to a stop facing the barrier at the exit of the hairpin. Jenson Button drops into 16th place as Sergio Perez produces a 1:35.001 to vault up to 10th. Oh now Mercedes are showboating as Lewis Hamilton puts down a thumping 1:32.844, before Nico Rosberg improves to move within a tenth of a second of Hamilton. Both are around a second quicker than Kimi Raikkonen in third. Here come Ferrari now and Kimi Raikkonen goes third fastest, but is half a second down on Lewis Hamilton in P1. Sebastian Vettel goes fifth fastest. Meanwhile, Sergio Perez, Carlos Sainz and Will Stevens are in danger of not making it through to Q2, while Marcus Ericsson and Alexander Rossi are yet to complete a timed lap. Williams are up behind Mercedes, with Valtteri Bottas third and Felipe Massa fourth. No lap time yet from either Ferrari, though. Marcus Ericsson spins off the circuit and off the track at Spoon. The gravel trap does its job as the sliding Sauber is slowed down and kept away from the barrier. What happened there!," he asks. Prior to going second fastest, Nico Rosberg had reported a concern with his Mercedes: "There's a problem with the engine when I pull out of the garage," he said over team radio. Max Verstappen is the early pacesetter but not for long as Lewis Hamilton storms to the top of the timesheet with 1:33.595. Nico Rosberg slots into P2 soon after, three tenths of a second slower than his team-mate. Not just Romain Grosjean and Pastor Maldonado on the hard tyres, 11 of the 14 drivers who have gone out so far are on that compound, the others on medium. Quote Message: To get through to Q2 we are looking at 1:35.6. Romain Grosjean was ninth quickest this morning with that time. To get through to Q2 we are looking at 1:35.6. Romain Grosjean was ninth quickest this morning with that time. Off we go then. The first part of qualifying is under way. Lewis Hamilton has never been on pole at Suzuka, will he rectify today? Niki Lauda on the speculation over the future of both McLaren drivers: “I said to Jenson yesterday, fight your fight with Ron Dennis over money, because it is always the same. But then stay, because if you go, one of the last quick guys has gone. So I say to Ron: ‘Pay him the money’. “What is the best combination to make the car go fast and develop the engine? It is those two guys. Put a young guy in the car and the engine does not go faster. Almost time for qualifying so here's one final look back at past races at Suzuka. Ayrton Senna secured the 1990 world championship after a first-corner collision with his title rival Alain Prost. In the picture below, Prost follows Senna back to the pits, looking pretty calm, despite what the crash cost him. Quote Message: Jenson wants to race. He still has a lot to offer, but there are unanswered questions. I think McLaren have bigger issues that they have to sort out. It is difficult times right now for McLaren. Jenson wants to race. He still has a lot to offer, but there are unanswered questions. I think McLaren have bigger issues that they have to sort out. It is difficult times right now for McLaren. A superb feature on Jenson Button on BBC One right now. Love his sense of humour. He was giving nothing away about his future, though. Jules Bianchi is not far from the thoughts of fans and teams this weekend, with Formula 1 back at Suzuka for the first time since the French driver's fatal crash at the circuit last year. A bit more from Lotus chief executive Matthew Carter in his interview earlier, and he says Renault’s buy-out of the team is close to being sealed. "As far as I am aware, there is going to be a press release from Renault next week," he said. Carter also expects the team’s court case over unpaid tax to be resolved. "I don't like routine. I like change and spontaneity. That's why I travel as much as I do. "One of the best things about F1 is that every year you arrive and the car is different and you are studying something new every year. Then through the year it shifts as well. "I love going to new hotels, meeting different people. I love that it's not the same every day." Still plenty of crazy hats on show as fans prepare for qualifying. There's a bit too much duct tape on this one for my liking though - 7/10 for presentation, 10/10 for effort. Just under 30 minutes to go before qualifying. Will Sebastian Vettel secure a fifth pole position? If final practice is anything to by, it looks unlikely, but they may well have some pace in reserve. Some light at the end of the tunnel for Lotus? The British-based constructor face an uncertain future amid mounting money problems and are in court for a third time on 28 September over an unpaid tax bill. However, Lotus chief executive Matthew Carter tells BBC Sport's Suzi Perry that things are looking "positive" at the moment. One of the many world championships to be decided at Suzuka was the 1998 one. A sensational blow-out dumped Michael Schumacher out of the Japanese Grand Prix, handing Mika Hakkinen the title. It isn't going to happen this weekend, but the world championship has been won in Japan on more occasions than in any other country. In total, 13 champions have been crowned in Japan including Damon Hill, who won it in 1996. Just how crucial is pole position? Just 46% of the total races at Suzuka have been won from pole. The last driver to do so was Sebastian Vettel in 2012. We were asking in practice earlier today for the strangest things you have seen in F1, keep them coming as we build up to qualifying and also let us know who you think will be on pole. Tweet to #bbcf1, text in on 81111 (UK only) and have your say on the BBC Sport Facebook page. “There are grey clouds to the north-west but the weather is coming from the other direction and it is sunny at Suzuka as qualifying approaches. It is a very warm day, 27C and quite humid and there seems no prospect of the action, which starts at 0700 BST, being disrupted by the rain that afflicted Friday practice. Lotus, struggling financially, are still locked out of their hospitality unit and if you have been following our coverage of practice you will have seen the team and drivers have been having to find elsewhere to eat their lunch. So where have did they end up today? So we know the Mercedes are looking like they are back on form, but what about the best of the rest? As far as that is concerned, Daniel Ricciardo was the standout performer in final practice. The Australian was 0.502secs behind Nico Rosberg, an impressively close margin on a circuit where lap time is quite power-dependent, an area Mercedes has the upper hand over Red Bull in. "They are very passionate fans in Japan and even today I still get gifts. David Coulthard finished on the podium on four occasions at Suzuka. If you have just woken up then what better way to kick off your Saturday with a bit of qualifying build up and coverage, live on BBC One and online right now. "The persistent rain of Friday was replaced by warm, dry weather and Suzuka was resplendent during practice, the sea and mountains clearly visible in the distance to the south and north. "Qualifying is expected to be dry and Lewis Hamilton and Nico Rosberg appear the clear favourites for pole position." Read Andrew's report from final practice here. Hello! Welcome to our coverage of qualifying for the Japanese Grand Prix. After Friday was a practical washout, the final practice session was, as expected, a busy one as teams learned as much as they could for qualifying and tomorrow's race. Nico Rosberg was the man to finish top of the timesheet, 0.297secs ahead Lewis Hamilton as the two Mercedes returned to their customary positions after their surprising struggles in Singapore last weekend. Are Mercedes back in business? It certainly seems that way, judging by final practice, as Nico Rosberg and Lewis Hamilton found themselves back in a familiar position - back on top of the timesheet. Will that continue that into qualifying? After Mercedes' struggles in Singapore, this chap looks to have played it safe by cheering on several teams judging by the variety of cars on his hat, but it looks like normal service might have resumed at the Silver Arrows. Has it? We'll find out in qualifying, so join us from 06:00 BST for all the build-up. Mercedes back on top then in final practice and looking good for qualifying. Probably the standout display from that session was Daniel Ricciardo, who was the best of the rest. Nico Rosberg finishes fastest in final practice for the Japanese Grand Prix. A minute left of the session and a final chance for teams to get some prep in ahead of qualifying later today. Back in business at Mercedes? Are Mercedes set to bounce back after disappointment in Singapore? They are leading the way in this session and the early indications are that Ferrari cannot compete with them around Suzuka. Kimi Raikkonen is sixth fastest, a second off Nico Rosberg's benchmark, with Sebastian Vettel eighth. Quote Message: Both Mercedes drivers have made a change to their front suspension. They are back out there now so let's see what Lewis Hamilton can do on a new set of medium tyres. Both Mercedes drivers have made a change to their front suspension. They are back out there now so let's see what Lewis Hamilton can do on a new set of medium tyres. Quote Message: Lewis Hamilton is the one who has stood out on the medium tyre. He has done some solid lap times. Sebastian Vettel does not appear to have the same medium-tyre pace. Lewis Hamilton is the one who has stood out on the medium tyre. He has done some solid lap times. Sebastian Vettel does not appear to have the same medium-tyre pace. A lock-up for Daniil Kvyat and he runs wide and into the gravel on the second corner of the Degner curve. "I need another go," he says over team radio. Kvyat is currently 11th fastest as we head into the final 15 minutes of this practice session. ...and it is second fastest for Lewis Hamilton as he clocks a 1:34.292, three tenths of a second off Nico Rosberg's time. A switch to medium tyres for Lewis Hamilton and Nico Rosberg. Can they knock Daniel Ricciardo off his perch? Just passed the halfway mark and Daniel Ricciardo continues to lead the way with 1:34.497. Felipe Massa is now second fastest, ahead of Valtteri Botttas, Max Verstappen and Carlos Sainz. Meanwhile, Pastor Maldonado is into the run-off area at Spoon Curve. No drama, though. Has Jenson Button's concerns with the McLaren been sorted? He leaps up into P5 with 1:36.174. Meanwhile, subdued stuff from Mercedes and Ferrari. Both yet to show their hand. They are all down in the middle of the pack in terms of the fastest times. Speaking of Gerhard Berger, here's a superb picture of him punching the air in delight as he passes the chequered flag in his Ferrari back in that 1987 race. Gerhard Berger, winner of the first Japanese Grand Prix to be held at Suzuka in 1987, is currently deep in conversation with Niki Lauda. Renault-powered cars lead the way as Max Verstappen, now on the medium tyre, slices the gap between himself and Daniel Ricciardo down to four tenths of a second. His Toro Rosso team-mate Carlos Sainz is third fastest. Not heard much from Mercedes so far in this session. Lewis Hamilton is currently seventh fastest, 3.8s off Daniel Ricciardo's time but still on the slower hard tyres. "Any thoughts what you want to do with the balance," he is asked over team radio. "More downforce if we have any," he replies. Quote Message: "It looks like most teams are running with a lot of fuel on board to get a lot of work done for the race." "It looks like most teams are running with a lot of fuel on board to get a lot of work done for the race." Daniel Ricciardo's switch from the hard tyre to the faster medium tyre has seen him make a gain of around 1.3s as he improves the P1 time to 1:34.755. Kimi Raikkonen, also the medium tyre, goes 11th fastest with 1:39.363. Just over 10 minutes in and Daniel Ricciardo makes the switch from hard tyres to the compound tyres. The two Ferraris have just emerged, with Sebastian Vettel popping out for an installation lap before heading back in. The laps are being racked up now, with 18 drivers having put times on the board. Daniel Ricciardo still has the early benchmark, with Max Vestappen in P2, half a second slower, Baltteri Bottas third, Daniil Kvyat fifth and Carlos Sainz sixth. There's also a few issues for a couple of the drivers on the circuit too, with Felipe Massa reporting a loose headrest, and Jenson Button complaining of "massive" understeer. No installation laps this morning as drivers crack straight on with putting in some timed laps. Daniel Ricciardo gets things up and running with a 1:36.010. Meanwhile, there's smoke coming out of the back of Romain Grosjean's Lotus. They spent very little time on the track on Friday. This should be a very, very busy session as teams cram in three hours of race and qualifying preparation into just one hour. There's a queue to get on to the circuit as they wait for the green light to go, which is subsequently does and Daniel Ricciardo leads several cars out on to the circuit. Coverage of final practice is live now on BBC Two. Get involved. Right, with fans wearing hats with cars on, another spectator dressed as a Geisha and F1 drivers in the multi-million pound sport of Formula 1 having to eat a bag of crisps for lunch, it is fair to say there have been some unusual sights so far in Suzuka. It is rude not to have a bit of fun in the early hours of Saturday morning, so what's the most unusual or wacky thing you have seen in Formula 1? Let us know via #bbcf1, text in on 81111 (UK only) and post your comment on the BBC Sport Facebook page. If you have pictures too, then send them in! It has been an unusual week for Lotus so far. The team faces an uncertain future amid mounting money problems, and found themselves locked out of their hospitality unit on Thursday and Friday, leading to some unusual pictures of Jolyon Palmer having to sit on the floor and eat a bag of crisps during lunch on Friday, and Romain Grosjean spending the interval sitting on some cool boxes. Bernie Ecclestone stepped in to make sure the Lotus mechanics would not go hungry, though, giving them access to the catering in the VIP Paddock Club. "They don't have to beg for food any more because we've looked after them," said Ecclestone. "It's not nice for the team. We've done all we can do." The fans at Suzuka have always been great, and really add to the buzz of the entire weekend at the Japanese Grand Prix. Here's a few more pictures of the fantastic fans at Suzuka. Great scenes. “The clouds of Friday have cleared, at least in the literal sense, but the metaphorical ones hanging over Jenson Button’s future in Formula 1 remain stubbornly persistent. “The bottom line is that Button has a contract for next year, unless McLaren decide to exercise their option to let him go - and their normal option date is 30 September. If they do not exercise it, he is contracted to drive for them in 2016. Of course, Button could decide he has had enough - of F1, of McLaren-Honda’s struggles, and, particularly, of McLaren chief Ron Dennis. And it seems his quotes suggesting he is equivocal about staying are part of a negotiating strategy. But giving up a seat in F1 is not an easy decision for any driver, especially someone who is still capable of competing with the best, especially when - according to sources close to the situation - in an ideal world he does not want to leave. Just got up? Yet to go to bed? However you have found yourself awake and following the action from Suzuka, here is what is coming up in the next few hours. Final practice is at 04:00 BST and live on BBC Two, with qualifying getting under way at 07:00. Build-up to that begins on BBC One at 06:00. Commentary on qualifying is also available on BBC Radio 5 live sports extra. "Saturday dawned dry, the heavy grey clouds of Friday replaced by wisps of white in a pastel blue sky. "After the insistent rain of first and second practice, Friday’s final session will be hectic, as Mercedes driver Nico Rosberg put it, as teams try to get all their set-up work, for race and qualifying, done in one short hour. Hello and welcome to qualifying day for the Japanese Grand Prix. Let's just forget Friday ever happened, shall we? A day of rain at Suzuka meant that, bar getting in a little wet-weather driving practice in, drivers did very little on the circuit in the two practice sessions. Today is a very different prospect. With just one hour of practice for teams and drivers to get themselves set up for qualifying and Sunday's race, they will want to get as much running as possible done in the final hour of practice, which gets under way at 04:00 BST. So, what did we learn from Friday practice? That Lotus is still homeless at Suzuka. That you can buy biscuits at Suzuka that look like asphalt and that Japanese F1 fans REALLY love hats with car parts on them. But as for the performance of the cars? Diddly-squat, as Lewis Hamilton put it. All thanks to the rain.